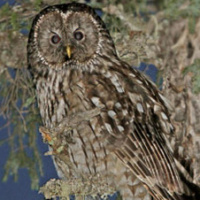 The Sichuan Wood Owl is a large owl with a rounded head and no ear-tufts. It is also known as the Père David's Wood Owl. Distribution: Endemic to central China occuring from western Sichuan to southeast Qinghai and southern Gansu. Original Description: Sharpe, Richard Bowdler. 1875. Ibis, 3rd Series, vol. 5: p. 256. 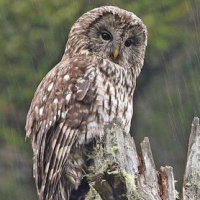 See also: Other owls from Asia, Genus: Strix. Page by Deane Lewis. Last updated 2015-11-07.